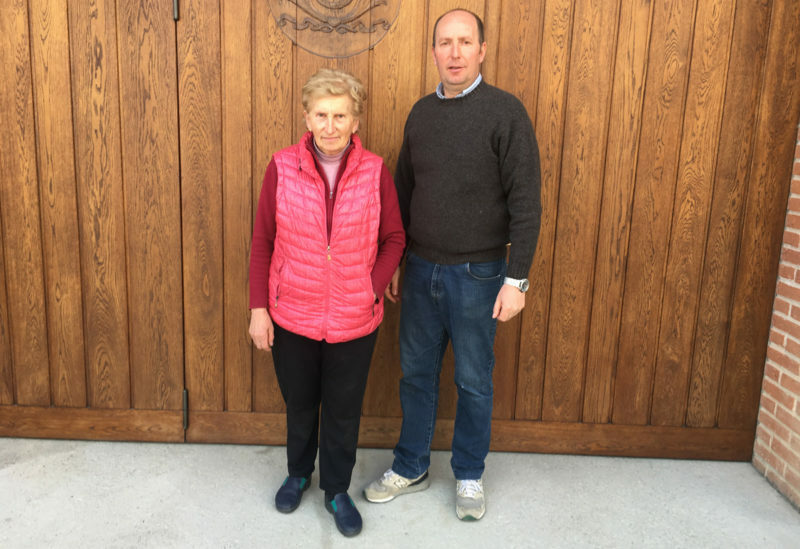 Marco Porello is the third generation of his family to produce wines in Roero, and he works the land with the help of his sweet mother, Nonna Porello (pictured). The family owns 15 hectares of vineyard land in total and these vines sit in Canale and Vezza d’Alba, two of Roero’s twenty-three villages. The Canale vines sit on the Monbirone Cru which is composed of marine clay based soil, and the Vezza d’Alba vines sit on the Tanone Cru on sandy, limestone rich soil. Climb up to the castle that sits above Marco’s home village of Canale and you’ll leave with a better understanding of how Roero fits into Piedmont as a whole – In simple terms to the South of the river you have the more famous (and more expensive) Langhe and where you stand (to the North of the river) you have the more humble (but often overachieving) Roero. Most people think Arneis when they think Roero, and while we love some Arneis this is shortsighted. Roero Nebbiolo and Barbera can be sensational and almost always come at a humble price. Michael Austin of The Chicago Tribune sums the situation up perfectly, basically saying that the wines of Roero are like the really good Rolling Stones tribute band at your neighborhood bar, that they are so dialed and so close to the original, that you’ll gladly fork over $20 to see them (and see them often) instead of $200 to see Mick and Keith themselves at the arena. Marco Porello is one of the most “known” names in Roero, and he produces two lines – His namesake Marco Porello line which is sourced from the estate’s oldest vines and sees a bit more wood, and a more value-oriented line called Ca’ Gialla, named after the yellow house on site inhabited by his mother and also made from 100% estate fruit, albeit with no new wood and slightly younger vines on average. Of these two lines Ca Gialla fits our portfolio the most strategically as it gives us affordable Piedmont options that show real personality and detail. The only thing holding these back from becoming “can’t miss” in our book was the packaging, and we’ve spent some time reworking these labels as you see below. All wines are farmed naturally without the use of herbicides or pesticides, and all yeast is indigenous. Marco is working towards organic certification. About that castle…The castle hovering above town is now a restaurant and hotel (the prior Contessa blew all of her money on booze and gambling a few years back and was forced to sell), and we enjoyed the view over some semolina crusted veal, tasting Marco’s 2018’s with big smiles. The local Piemontese dialect for sharecropper is “schiavenza,” and this much-buzzed about estate takes its name from the sharecroppers who formerly worked the property’s vineyards during the time that it functioned as a hospital and school as part of the Opera Pia Barolo (you can think of the Opera Pia Barolo as a similar entity to the Hospices du Beaune). Brothers Vittorio and Ugo Alessandria revitalized this property in the mid 1950’s when it was in need of such work, and things are thriving under the current second generation, with farming and winemaking led by son-in-laws Luciano Pira and Walter Anselma. A name like Schiavenza should give one a clue as to the style here; this is a “traditional to the bone” property with a foundation of organic farming and Slovenian botti, nothing more and nothing less. Vineyard holdings have expanded over time, and the estate is made up of ten hectares split between Serralunga and Monforte. These include the heralded crus Prapò, Bricco Cerretta, and Broglio. 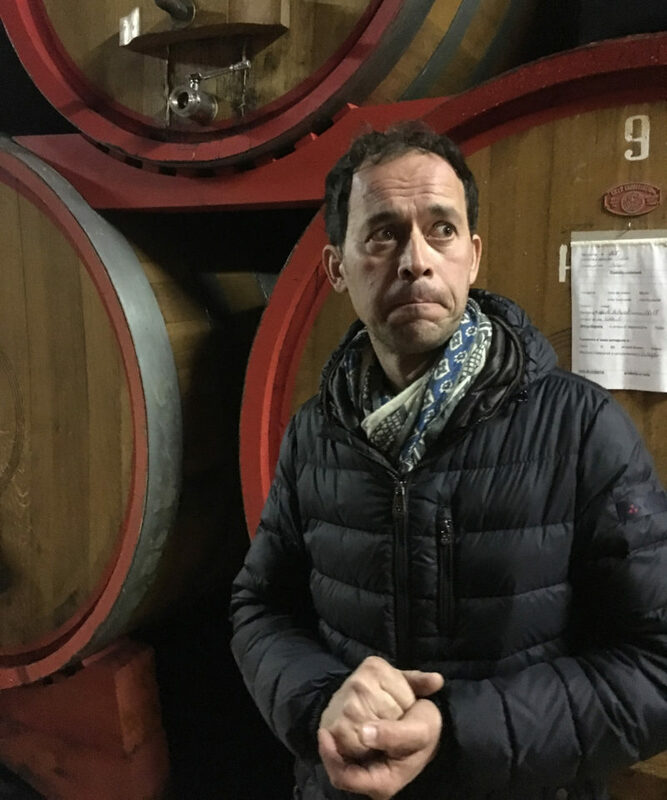 We sat down with Walter Anselma, plowed through some Pomerol samples (there’s no better way to evaluate important samples, than with a very good winemaker in a very different region), and then dug into the good stuff – Schiavenza’s current bottled releases. 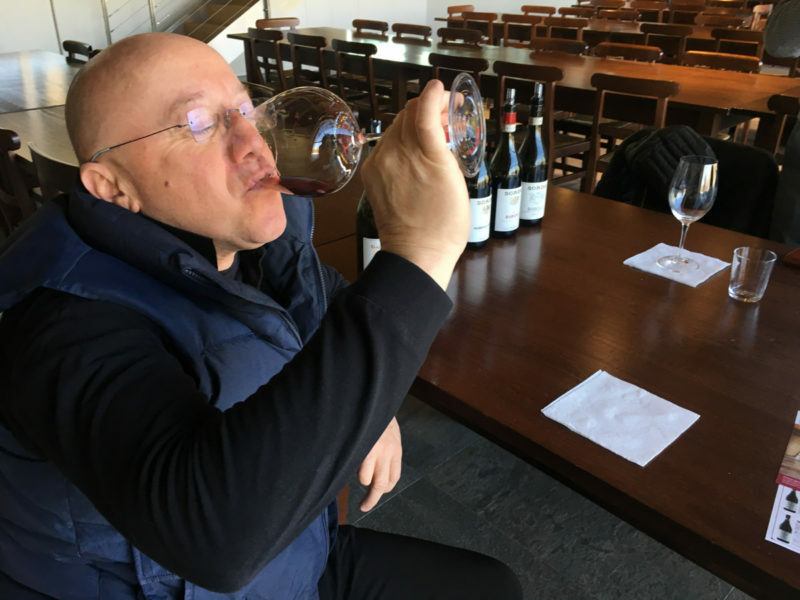 Thus far we’d had quite the eventful string of visits in Barolo, but when we tasted Walter’s 2016 Barolo Serralunga from botti we were floored. To achieve this kind of finesse with equal levels of concentration is at the same time astounding and unreal. We bring you good news – Traditional winemaking in Barolo is all well. Also worth noting is the family’s restaurant, which sits above the winery and sports one of the best views in Barolo for those fortunate enough to score a patio seat. We went through some recently bottled wines while eating the two food specialties that Piedmont executes best – Carne crudo (hand chopped raw veal seasoned with salt, pepper, and just pressed olive oil) and tajarin (paper thin narrow egg noodles dressed in ragu). Walter informed us that one can use up to 40 egg yolks in one kilo (2.2 lbs) of flour when making tajarin. How can you leave this place thinking anything else than what a glorious time in history it is to be alive as a human! The Zeni family has spent the last 140 years dedicating themselves to producing individual wines in and around Verona. In total 125 acres are farmed here, 75% of which are planted to red varietals. They operate two wineries, with the primary winery being based in Bardolino on the shores of Lake Garda. We carry most of Zeni’s classic line (Bardolino, Chinatto, and Valpolicella), their Ripasso “Margone,” and their flagship Amarone Vigne Alte. Most of Zeni’s production (and all of the particular items we carry) represents traditional Veronese wine at its finest – Pergola trained vines, no barrique, minimal intervention, and lowes in appellation (ie almost zero) residual sugar levels on Ripasso and Amarone. Fausto Zeni is the newest generation to run things here, and the winery appears to be thriving. Their Ripasso “Margone” and Amarone “Vigne Alte” are exactly what we look for in terms of style, and you’ll all have the opportunity to go big on both as we’ve queued up two large loads for you. As for Chiaretto? That typical Veronese style rosé you keep hearing about these days? We are lucky enough to still have some 2017 from Zeni and it is in such a perfect place right now in terms of fruit/balance/complexity…If you are reading this and have access to a bottle do yourself a favor and pop one! The brother and sister duo of Camilla and Francesco Scavino founded La Carlina in 2014 at the foot of the Medieval castle that towers over the village of Grinzane Cavour. The name “La Carlina” is a reference to the farm of their grandmother where the family would celebrate and party, which is also the place where Camilla and Francesco began experimenting with winemaking as teenagers. 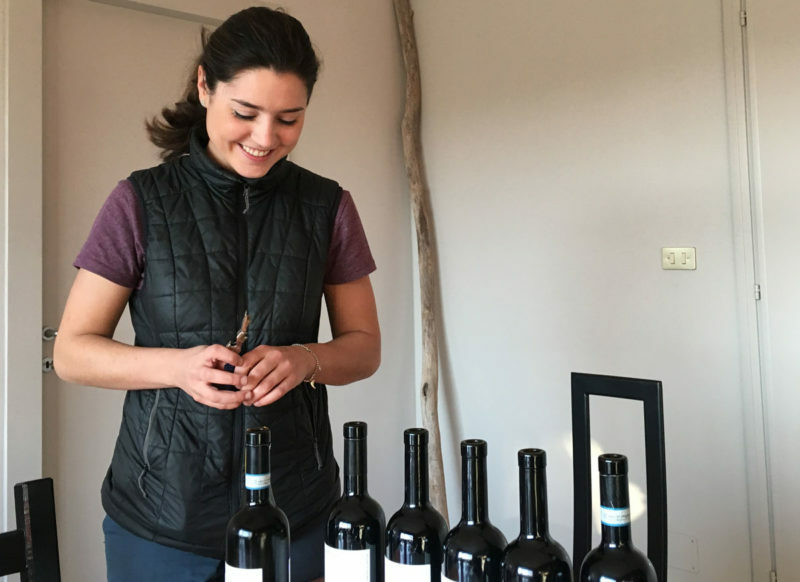 You could probably call La Carlina Piedmont’s “newest” producer – They’ve been producing their own wine for about five years now and are releasing their first Barolo this year. Overall holdings are actually pretty significant, consisting of 8 hectares of Barolo alone! Vineyards are scattered between the hills of the Langhe and Monferrato (although most vines conveniently sit at the base of the winery), and farming is strictly organic. 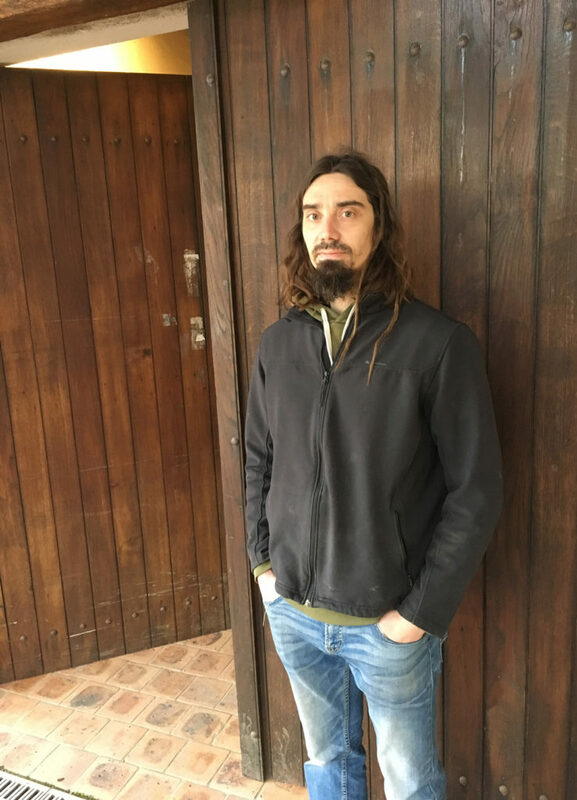 There aren’t many “hipster” winemakers in Barolo, a tradition-soaked region where one hectare of land is valued at 3 million Euros, but Francesco is one of the few. For us this means an openness to experimentation that we take for granted in places like Saumur or Kremstal, but rarely see in Piedmont. As for Camilla, she is as smart as they come but at the same time constantly bubbling over with charm and laughter. Carlina’s two examples of Favorita are can’t miss items – One is fermented in amphora with extended skin contact and the other is clean and uber-crisp, only seeing steel tank. As for Barbera Superiore you don’t see much of the category in the market overall, and Carlina’s example is top rate with opulent fruit and minimal wood. We can’t wait to pick up their Barolo – It fits an interesting slot in the Grape Expectations portfolio as Grinzane Cavour Barolo is famously elegant and arrives a bit lower in price than similarly pedigreed wine from Serralunga or La Morra, et all. If we work out the right numbers with Camilla this could end up our “Crous St. Martin” equivalent in Piemonte and with eight hectares they actually have some volume to play with! La Carlina 15 Barolo – Elegant style, strawberries, roses, mineral… packed with flavor and complexity and showing well even at this young an age. Click here for the episode link on Spotify, and here for the episode link on iTunes. JM: So we’re here with Mr Manfred Felsner from Weingut Felsner and we’re talking about release dates when it comes to Austrian Gruner veltliner. A lot of people in the US market especially, you know, they want brand new vintage Gruner right away. And a lot of what we’ve tasted has led us to believe that fresher isn’t always better. It’s certainly the case with Felsner, always has been. Here’s Manfred telling us why that is, why he believes in giving us fall bottling Gruner rather than Gruner that is bottled in the winter of that year. MF: Oh, well with Gruner Veltliner needs a time of contact on the lees because the lees is keeping him fresh. There is a process called autolysis and every day coming some new bubbles from the lees and gives him a fine CO2 and in the end it makes him a younger for a long time. So a wine who is bottled in autumn time keeps for sure five, seven years. If you bottle the wine in springtime then it’s very quick old, maybe after one year. So that’s why I like wines were bottled in autumn. Then you, you have fun with this wine for the next 7 years for sure. JM: Oh Wow. So one year versus seven. That’s pretty, it’s a pretty incredible difference. MF: Uh, yes. 2017 was in generally a really dry year, maybe one of the dry years from all. So we had no rain for three months, but the vines are helping themself. We had a similar effect like in Sicilia, so when it was to dry, they did nothing for one month and then in August we had an nice rain. And then the sugar content was growing up very quick. So when we pick the grapes, we had an nice sugar content, but also a nice acidity. And 2017 Gruner was in spring time a little bit rough because there was some tannins because it was very try. But then later in the summer times it gets smoother and smoother and now it’s really perfect. He have a nice acidity. The tannins are away now and even nice mineralic taste. And it’s a great, for me it’s like really a great, vintage, which will keep long in the vinotheque. JM: Great. And tell us about your vines. Something that we always tell our customers when we’re talking Gruner, when we’re talking about Felsner, is that you guys are so different because you have this, these holdings, of very, very old vines. You know… some of the… if you looked at producers and Kremstal and you looked at the age of their vines, you guys have probably on the whole, the oldest portfolio of vines. Um, tell us about that and what that does for the finished wines. MF: Uh well, when I left the vintner school we learned after 25 years you have to pick out the vines and make a new vineyard because then they are two less fertile. But I found out that the wine from the old vines, have more aroma spectrum as the young vineyards and so I was one of the first in the region who start to make always new vine. So when the one vine was dying, I pulled him out and put a new one. So, and now our oldest vineyards are more than 60 years old. So it would be a lie to say every vine is 60 year old, but I have a mix from one to 60 years because every year some hundreds are died because they are too old and that I picked them out and make a new vine in. And so I have always a blend of different years. But in some [unintelligible] the wine is very special because you have the extract from the old vines because their root system is very deep, sometimes more than 10 meters or you’ll have more facet of ground floor and the young wines are a little bit thinner, which is also good. So because when a white that is too fat, it’s also not good. So the mix of young and old vines, it’s really interesting. It’s a big aroma spectrum. JM: And it looks like we have a little bit of 2018 vintage as well. MF: I bottled these on Wednesday, so just a little shy, some pallets because I need for the German market. But I generally like to bottle when I get the order because if they are on the lees it’s better for the wine. JM: So let’s talk about rosé. You know, we’re coming right into rosé season. We have that amazing Zweigelt rosé from you. Tell us about that. Let’s taste it too. MF: Yes. Uh, the, the global warming is helping us a little bit at the moment because when I was in vintners school 27 years ago, I liked the bronze rosé, but now I found out they are high in alcohol, they are oily, they have no acid. And now our rosé is tasting like in the Provence around 27 years ago. MF: So we have a really fresh, lively rosé. Nice summer terrace wine, works also good with seafood, uncomplicated, easy to drink with seafood, also pour just to have fun. I think in future that people will talk more about Austrian rosé because the business is growing every year because we have this nice acidity which makes him so, so nice to drink. MF: Should I tell you about the production also? MF: Yeah. There are two possibilities to make rosé wine. You can either put it away after crushing the grapes for red wine. So if you’re crushing the grapes for red wine, you can give 10% away then you have a rosé and the red wine is more concentrated. But I don’t like this type of rosé because he’s rough and he have also tannins. What we do, we harvest mostly the north part of the vineyards, our terraces are running west-east. We are cutting mostly than north part. Then we have chill (?) growing grapes and then we pressed them very quick, like white wine and we wasting the color. But the wine is more white in character and so sometimes it’s like a Riesling, just a rosa, which is really nice to drink. JM: Totally. Yeah. I think this is, this is interesting because I liked the comment about just being kind of similar to a throwback Provence rosé, where a lot of Provence rosé now is, you know, has less acidity than you would want. It can be sometimes almost banana-ee in really warm years and this has that really beautiful elegance, real pale color. Now you can tell that it’s not a saignee wine when you look at the color, you know, even for something like Zweigelt, which you’d expect a lot of color from. Its real pale color is beautiful. It’s paler than prior vintages. I feel like. JG: Like a summer one. I like it. Okay, well that was informative and insightful. Thanks a lot Jeff for bringing that to us. Danke Schoen Manfred and all that talk of rosé is making me thirsty. Okay. Time to go. See you next time. The venerable house of Giovanni Sordo lies in the heart of Castiglione Falletto and has been producing traditional Barolo for just over 100 years. It’s a family-run winery now in the capable hands of Giorgio, Giovanni’s son, the third generation of the family. Everything here is sustainably farmed, and current holdings come out to 53 hectares in total, making Sordo one of Piedmont’s most recognizable producers. Producing separate “Cru” bottlings is surprisingly something new at Sordo – Until about five years ago most everything went into their regular DOCG Barolo. The family holds an insane collection of elite-level cru vineyard sites covering the townships of Castiglione Falletto, Serralunga d’Alba, Monforte d’Alba, Barolo, Novello, La Morra, Verduno, Grinzane Cavour and Vezza d’Alba and they are the only existing Piedmontese winery that can boast offerings from eight different specific Crus. We enjoy showing wines from Sordo side by side, as Sordo’s “naked” approach to winemaking means marked differences in the characteristics of each site (you’ll never see a barrique inside these walls). Take a look at the video below and you’ll see what we are talking about. Here at Grape we love selling some older wine and as you’d guess we asked Giorgio about older vintages, both large and regular format. To our surprise there are plenty of options on that front! If you are an active wholesale customer of ours you can expect a craaazy back vintage pre-arrival offering this week…including the below bottlings, all of which are singing right now. Upon driving through the “gates” of Feyles things get spooky – Not in a bad way, but in a manner that suggests you’ve entered a different dimension in time. Hitchcockian. The story has it that this compound served as a slaughterhouse in days gone by. You wouldn’t guess so now, as there are probably sixty concrete vats scattered outside, of various shapes and sizes, all well-weathered, under a tin roof with thousands of rust holes that pepper the place with pin-sized, almost star-like beams of sunlight. Things are plenty messy but not what we’d call “dirty.” Walk inside a small building to the left and you are greeted with a humble but modern bottling line, shiny and clean to Thomas Keller standards, and somewhat inexplicably you run into four massive, fairly new, Slavonian oak casks. Antonio himself has enviable energy for a man in his mid-eighties. They say intention brings longeivity, and Antiono has single handedly taken care of all the estate’s winemaking for the last 56 years. With Antonio and what he is doing at Feyles, we are looking at an estate in its prime. There does seem to be some succession plan in place here – Antonio tells us he has a son living in Paris. Is it our duty to put Feyles on the “map” so to speak? Vinification is totally non-interventionist with a minimum use of sulphur. The wines mostly finish fermentation with some residual sugar, which is “eaten up” during aging which takes place in Nicolas’ outdoor graveyard of small, very weathered, pre-war concrete tanks. All wines are aged before bottling for 5 years with the exception of Dolcetto and Barbera. It goes without saying that we found no evidence of “climate control” anywhere, and shockingly, no evidence of volatile acidity either. All wines are bottled unfiltered and taken to a protected environment for further aging. The young wines are not so different from the old ones, nor are they much more colored, all oxidation almost certainly comes during alcoholic fermentation, which goes on for years in some cases – One of his two vats of 2014 Barbaresco must have still had what our palates estimate ten grams of residual sugar in it, and when questioned Antonio shrugged implying that fermentation would commence again this summer after he racks it to tank, and that like everything else through the years here this Barbaresco would finish dry. After tank aging the wines are then kept some five years in bottle. We received no clear answer to our question as to why. For Frank and I the over-the-top aging in bottle does not add all that much, but it is of course joyous to come across this ability to pick up and offer you ten year old Barolo and Barbaresco as “current release” material. 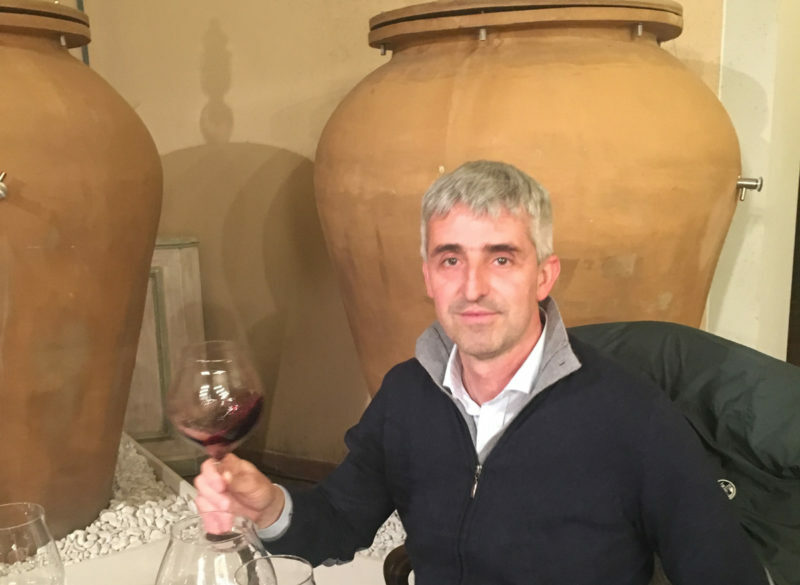 Antonio produces two Baroli, both Cru bottlings from six acre plots – Perno in Monforte and Sottocastello in Novello, with an indication of the specific plot within each Cru. The same holds true for Barbaresco – Five acres of holdings, from plots in Montesommo and Borgese, both in Neive. His outstanding Langhe Nebbiolo is actually a second wine made from declassified fruit in the Barolo and Barbaresco vineyards. Vinification and aging of Barbera and Dolcetto comes more quickly, as you’ll see with the below release dates, and these wines come from the same part of Perno as the Barolo. Collectively Frank and I have visited many wineries over the years, and have never witnessed such natural winemaking, not even at the most hipster of locales, and the most shocking bit is that there were zero flaws in anything we tasted. The overall shock factor of this visit takes me back to the first time I tasted wines made by Frank Cornelissen, and while to this day tasting Cornelissen remains one of the more interesting vinous experiences one can enjoy, diving into Feyles you trade “interesting” for silky, almost ethereal palate pleasure. Simply put, I’m at a loss for words. Everything about Feyles goes against all logic. We tasted ‘10 Barolo and Barbaresco from concrete vat, they showed similar to the ’08’s but with a bit more power. Additionally we tasted two separate casks of ’14 Barbaresco Riserva Montesommo, the fist being quite dark, concentrated, just outstanding, and the other similarly rich but with noticeable sugar still remaining. Assorted ’13’s from vat were similar, but less developed as expected. You can expect these to arrive in early Summer. 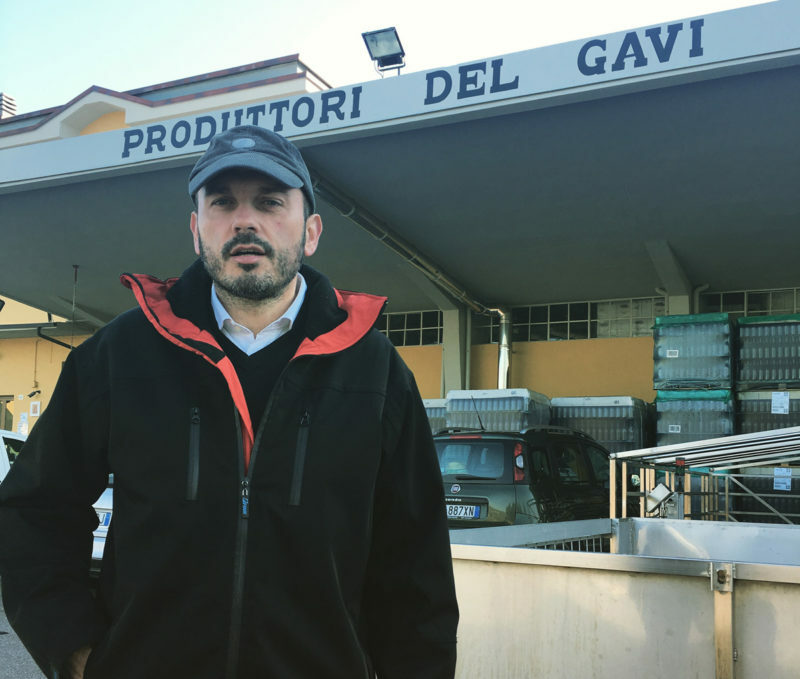 Cortese di Gavi DOC – The most basic level, this can be produced anywhere and is the go-to local quaff in Gavi (along with a focaccia sandwich it is even part of breakfast for many locals, especially those over 70 years old!). Gavi DOCG – A step up in quality, this an be produced only in a few of the region’s best towns, and is most of what you see here in the USA. You could call Gavi the “queen” of Piedmont’s white wines – Gavi must be made from the local varietal Cortese, and Cortese translates to “gracious” in Italian. Cortese has thin skins, naturally high acid, and it needs a warm climate to grow in. Nowhere does it grow better than in Southeastern Piedmont just North of the Ligurian coast. At its best Cortese is bone dry/with lemon/peach flavors, but at the same time classy. Add in some seafood and you are instantly transported to a very happy place. 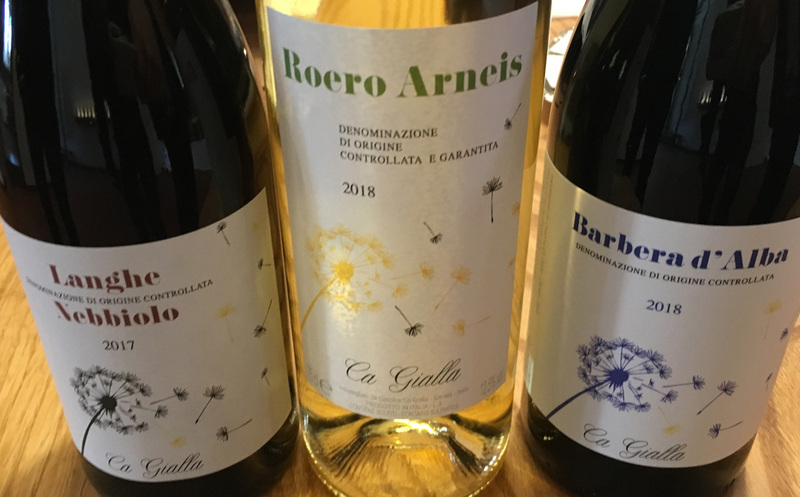 Soil composition and exposure in Gavi is varied even by Piedmontese standards, and in this way the Cortese grape can express an enviable “menu” of flavors depending on said provenance. Our good friend and oracle Roberto Fossati lives in the village of Gavi itself and over the years he has seen just about everything here. Jump in Roberto’s car to visit vineyard sites and you’ll experience all this diversity firsthand, from stark white soils made of tuff and limestone to tomato colored soils based on ferrous clay. Enter Produttori del Gavi. The origins of this cooperative trace back to 1951 when 83 families banded together to share their strengths in cooperative form. The group is essentially made up of these same growers to this day, with just twelve more being admitted to the group since inception. The vineyards of member/growers are spread all over the Gavi DOC territory in 11 municipalities covering 200 hectares of land from Tassarolo to Bosio. Such coverage allows the production of various “Cru” bottlings, many of which are amongst the most exciting produced in this historic appellation. 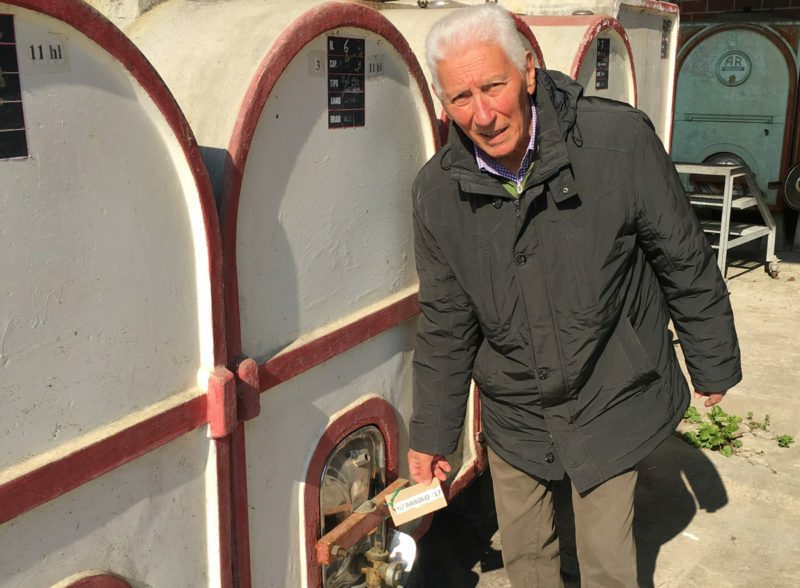 Produttori used to sell off 99% of their finished wine in bulk and from those gas handle type dispensers you see all over Europe, but oh my how things are changing inside the walls of this cooperative. Winemaker Andrea Pancotti leads the charge here now, and this is an exciting development for wine drinkers. Andrea understands the potential of the material at his fingertips (hand-farmed, low-yielding, old vine Cortese from thousands of interesting micro-plots), and the press has just started to recognize Produttori’s work, with Gambero Rosso bestowing his latest Gavi de Gavi release with the coveted “Tri Bicchieri” honors. Andrea is making single “cru” Gavi, he is making organically farmed Gavi, things couldn’t be any different there nowadays versus years past. Until recently, the only thing missing was an attractive label, which we took care of with a local designer last Spring, and we already know you all love Produttori’s new package. And the pricing? This is where it gets crazy – We negotiated DEEP with Produttori last week, and because they want everyone in the USA to be aware of their “brand,” they offered us a multi-container commitment deal that we could not refuse. Our vision is to build Produttori’s “Il Forte” into the most recognized Gavi label in the US market, as it is by far more interesting than anything else out there that restaurants can buy under $10 wholesale. Game on. 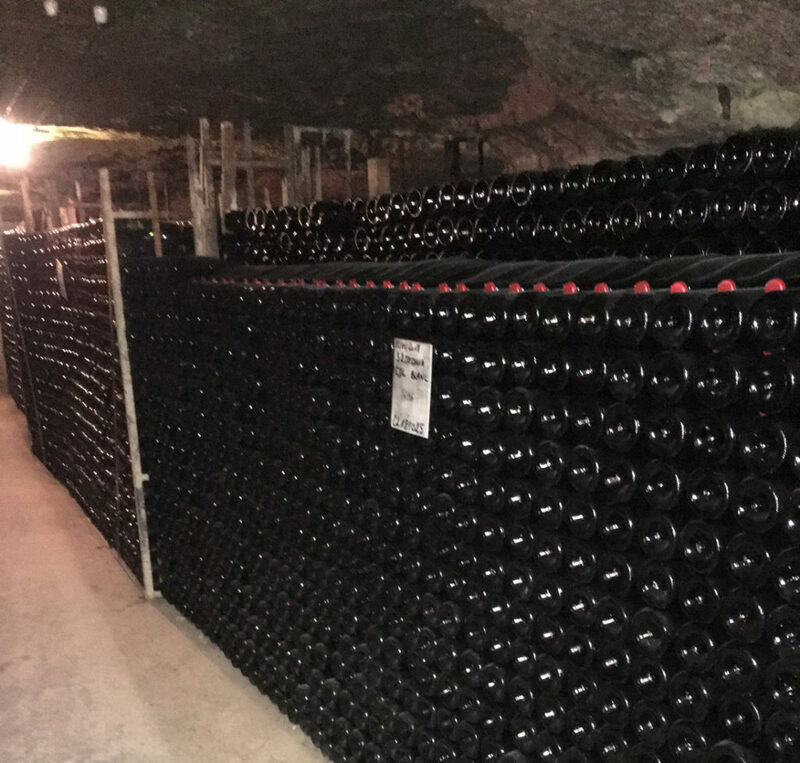 The final leg of this intense tour took us (fittingly) to Champagne, where we spent full days with both Champagne De Saint Gall and Champagne Moutard. 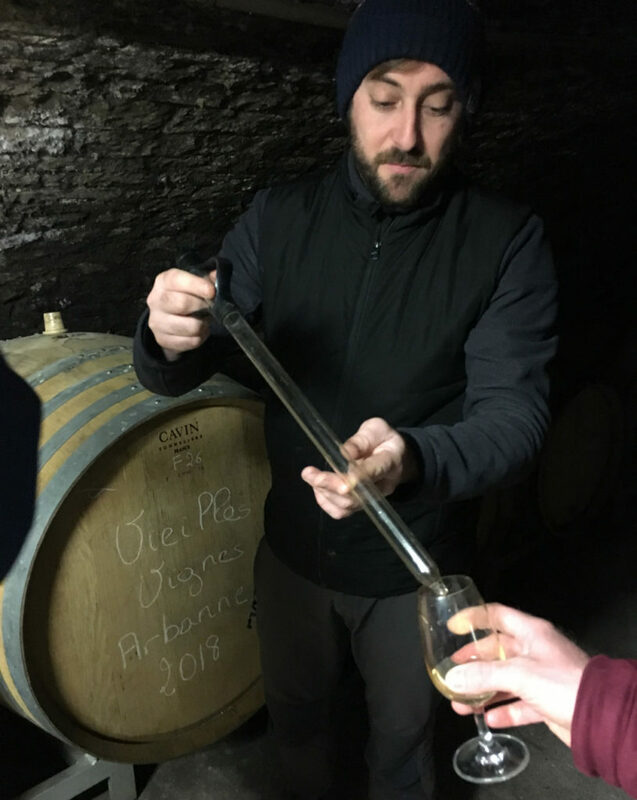 Alex Moutard shows us Arbanne in barrel! Lucien Moutard began producing Champagne under his own name in 1952 from grapes grown on his family’s land in the Côte des Bar. The Côte des Bar is situated in the Southeast of Champagne’s boundary, about 2 hours in a car from Champagne’s capital in Reims. You can think of the Côte des Bar as an island in and of itself, as the subregion is actually isolated from the rest of the Champagne. This “underdog” terroir is super hot right now, and for good reason…The Côte des Bar was “kicked out” of the greater Champagne region in the early 1900’s, producers rioted, they’ll have a permanent chip on their shoulder, and are therefore more experimental and rebellious. Whereas most of Champagne is relatively flat and densely planted to vines, in the Côte des Bar you’ll find a bucolic, relaxed, “backwoods” vibe where vineyards are leisurely interspersed with forests and streams. Unlike the rest of Champagne where Chardonnay is king, in the Côte des Bar Pinot Noir dominates, making up 85% of plantings – A slightly more Southern location compared to the rest of Champagne means that it is warm enough for Pinot Noir to thrive, and Pinot Noir was the grape originally planted in the area by monks. Large amounts of clay are interspersed with the limestone in the soil here – This means a bolder fruit profile in the finished wines. The region is dominated by small growers, whose focus is on making singular/interesting wines. Drive into the sleepy village of Buxeuil and the first thing you’ll see is the start of the Moutard family’s expansive compound which is peppered throughout the village and snakes below streets in the form of tunnels and cellars. If you weren’t aware of the fact that the family operates the second largest distillery in Champagne, this is worth noting, as this is where all of their pressed juice goes – A huge advantage as they only “need” to use free run juice in their Champagne. Most of you know Champagne Moutard by their perennial NV Grande Cuvee Brut, which is probably the best selling indie Champagne in the United States. 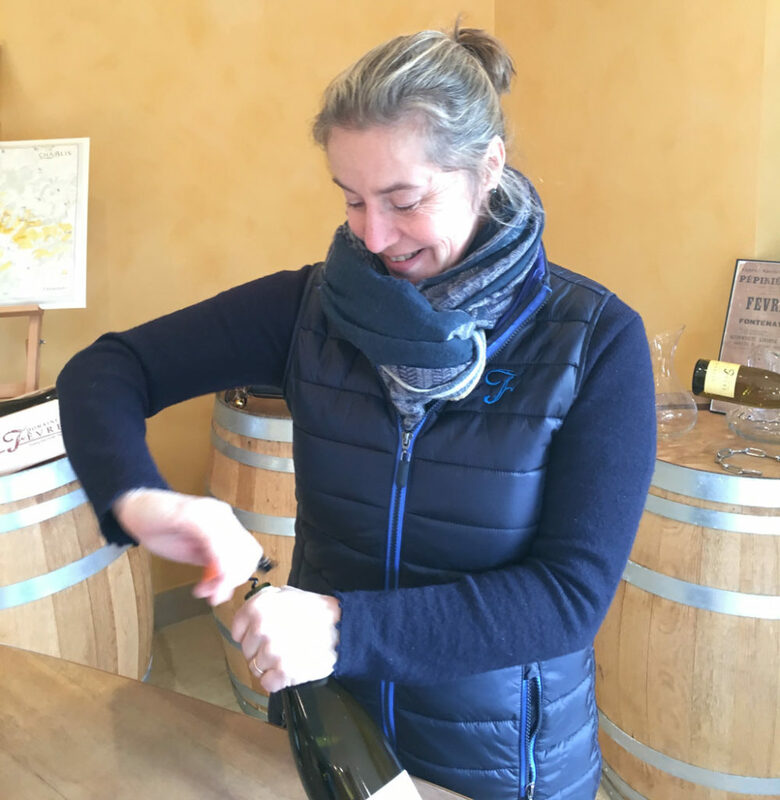 From their singular bottling of the endangered Arbanne grape to some fun and juicy Pet Nat, we were looking at a table full of Champagne and Burgundy (the Moutard’s recently acquired a Domaine just North of Chablis). 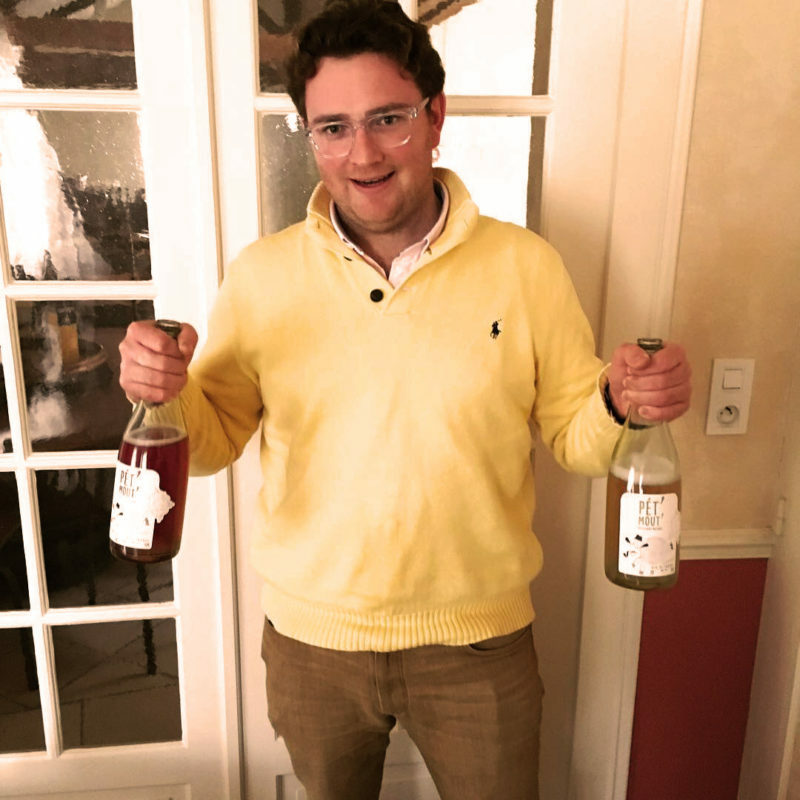 The young Alex Moutard is a winemaker coming into his own, and his focus these days is clearly on minimal/no dosage micro bottlings from specific plots. This was an eye-opening experience, whether we were talking about touring some of the Grand Cru vineyards in Avize, to visiting Champagne Le Mesnil (where more than half all Mesnil’s Grand Cru fruit is processed), learning how the organization works (true to fashion, it’s owned and run by the farmers), learning how farmers are actually paid, and of course, tasting the wines (both reserve still wines and finished bottles). If you are still reading this you are saying ok that is all great but how did we get here in the first place? Ok – Let me digress just a second into an all too familiar story these days. Family farmers in, let’s say, middle America, are getting squeezed due to soy or wheat prices being down for whatever reason and operational expenses continuing their never-ending march upwards. A farmer can get by for a year or two by tightening their belts and taking out loans. But there’s comes a time when the last resort has to be looked at; selling the family farm. There’s always a buyer, but it’s usually not the neighbor. The result is a higher and higher concentration of farmland is controlled by fewer and fewer hands. Not an ideal situation. And the same thing is happening in France, well, actually the entire world. Here at least we can offer up an example of how this story might be different. Enter Champagne de Saint Gall. You probably already know about how the growers of Union Champagne (de Saint Gall being the company’s own Champagne) control more Premier and Grand Cru vineyards than any other entity in Champagne and that they sell the majority of what they produce to the large Houses. For me, however, the story lies in this organization’s mission to not only produce fine Champagne from some of the best vineyards in the region, but too also strive continue the to maintain the culture and character of Champagne as a whole. The message one comes away with is that for this to be successful, the small farmers need to be able to survive and make a decent living. We’re not talking about farmers who set out on their own to join the world of farmer fizz. They own enough vineyard land to make a go of it. No, we’re talking about the majority of farmers in the region that own an acre or two and don’t have the money, marketing chops, or desire to commercialize their own label. These guys are farmers, people. Their tiny parcels have been handed down from generation to generation. 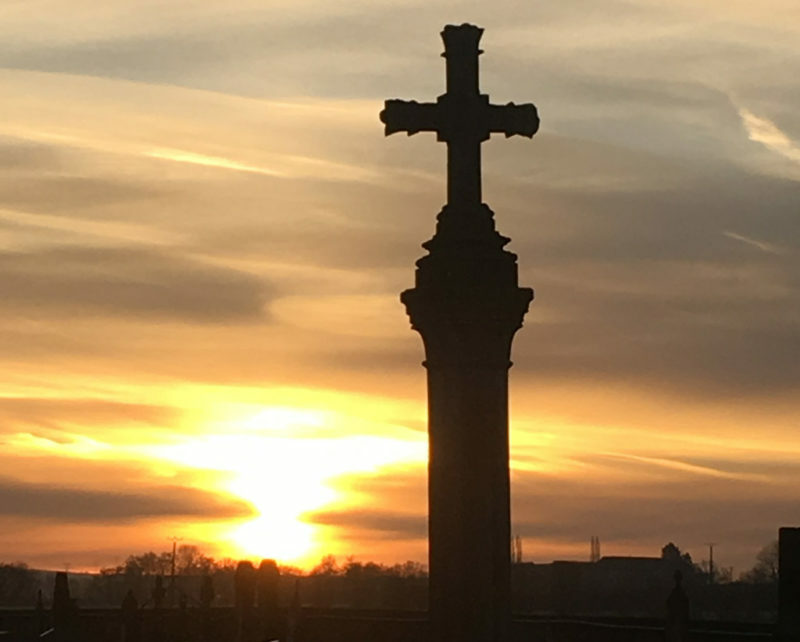 People in Champagne don’t sell their land because they know that once they do, they would never be able to repurchase it again, unless they won the Powerball and that’s not in France…yet. And this is where the Cooperatives come in. Union Champagne has set up a system whereby the farmers are paid well for their fruit. In great years where there’s more abundance, there’s a formula that allows for a certain amount of still wine to be processed beyond the annual limits (yes there are limits) and then these reserves can be tapped into in a more difficult year to offset the lower quantities of that vintage. They would then be paid for the fruit processed in that bumper year. Kind of like a savings bond smoothing out the roller coaster ride of the stock market. The end result is a much more stable local economy and more small, family-owned vineyards remaining just that, family-owned. This takes off the some of the pressure to increase yields and just sell to the “big guys” directly. 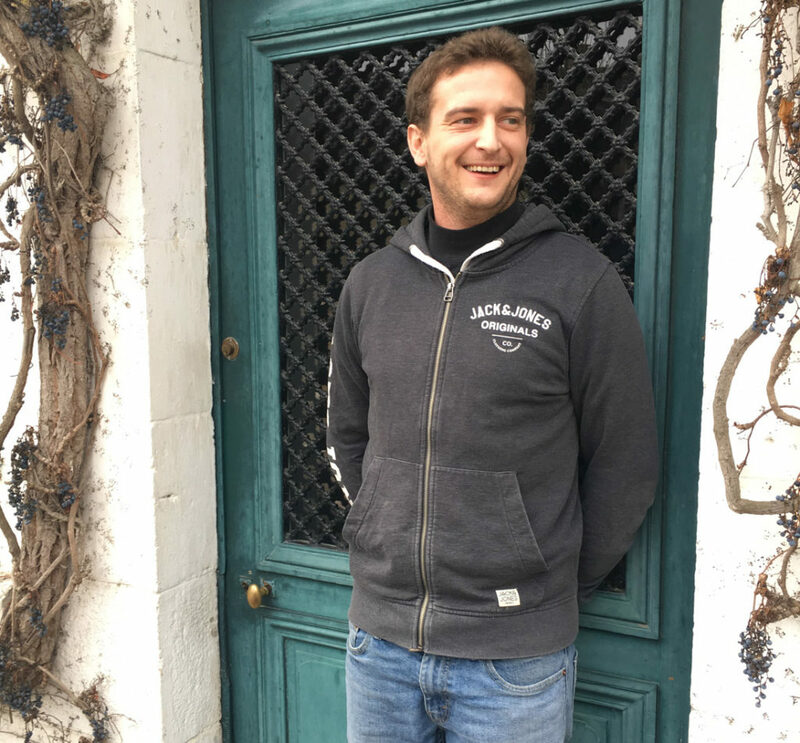 These growers are then able to adopt changes in farming practices, under the advice and tutelage of Paul-Antoine Dauvergne, Union Champagne’s young vineyard guru. All this has the end result of a higher quality of fruit being delivered to the nearby co-op facility (there are 14 such facilities under the Union Champagne umbrella) to be transformed into delicious, non-bubbly, Champagne gold. From there the still wines are transported to the central winery in Avize where they are stored, blended, bottled, cellared, disgorged, and packaged, all this under the watchful eye of cellar master, Cédric Jacopin. Not an easy job I guess. …Coming down the tube will be a new package for the 2008 vintage as well as a vertical in an elegant wood box. Don’t wait – be part of the cutting edge. Domaine Dauvissat Camus 2017 Petit Chablis, concentrated for the ac, tight, but pleasant. Domaine Dauvissat Camus 2017 Chablis, more complex and saline, tension. Domaine Dauvissat Camus 2017 Chablis “Sechets,” dry and austere, nervous. Domaine Dauvissat Camus 2017 Chablis “Vaillons,” more fruit and fat. Domaine Dauvissat Camus 2017 Chablis “La Forest,” shy, fresh, typical. Domaine Dauvissat Camus 2017 Chablis “Preuses,” other dimension, powerful, complex, finesse and tension. Domaine Dauvissat Camus 2017 Chablis “Clos,” fatter, but also drier, salinity, mineral. Our allocation this year is slightly higher than previous years, something we are thankful for. Just before we were to leave Vincent knocked the wax off of some 2003 La Forest…most of you remember this vintage as an unreasonably hot one (hot for the ages), and the wine was shockingly fresh and nuanced. We’ve been selling Lamblin for years. Few of us have actually visited. 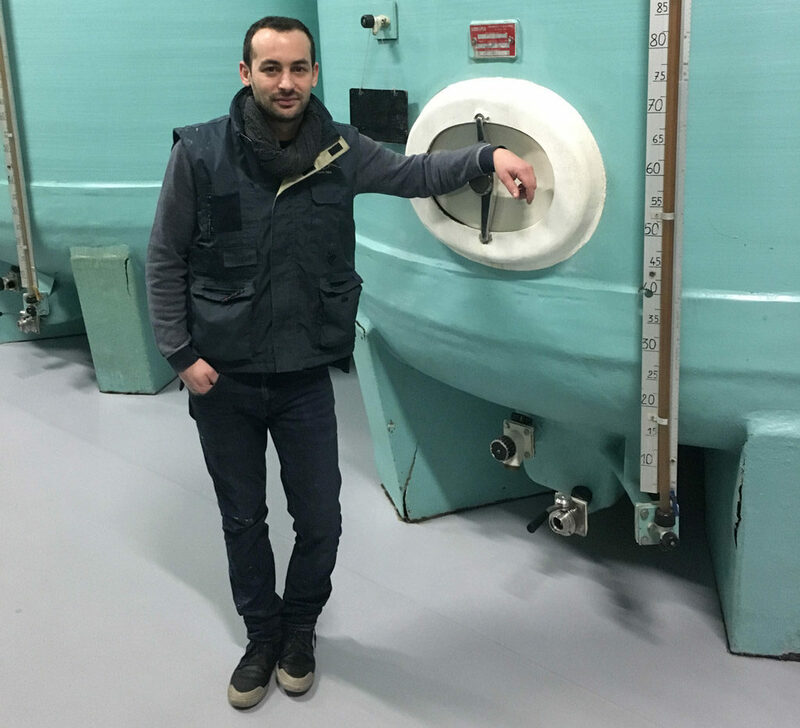 When we’d think Lamblin the first thought was unbelievable value in Burgundy and Chablis – We didn’t expect to come across such a sweet, intentional, family-oriented operation, and we figured this would be more or less a tank farm (which it was not). How they pack so much into these bottles at these prices is beyond us but we will take it! We were actually kind of surprised to hear that we were their largest importer in what is their largest market outside of France (the US). We’ll take it. Get ready for more bottlings from this house, including a blockbuster Petit Chablis! One of Chablis’ most recognizable names, branches of Fèvre family have been producing wine in the region since the early 1800’s. Nathalie and Gilles Fèvre base themselves in the village of Fontenay-Pres-Chablis, where they operate a Domaine that is impressively large by Chablis standards with over 100 acres under vine in total including a large proportion of classified holdings (Grand Cru Les Preuses, 1er Cru Fourchaume, and 1er Cru Mont de Milieu). 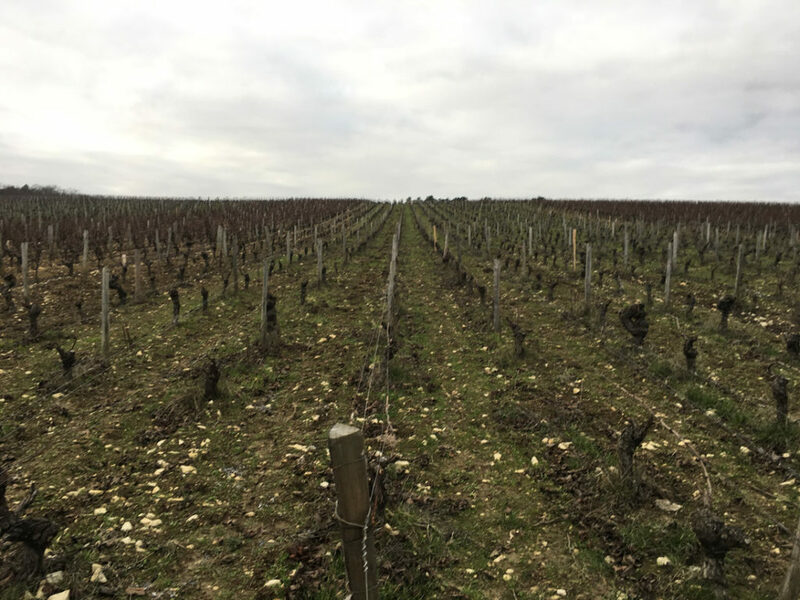 It is worth noting that their basic “AC Chablis” holdings are unusually strategic, as most of their acreage sits on the Côte de Fontenay just northeast of the region’s coveted Grand Cru slopes. 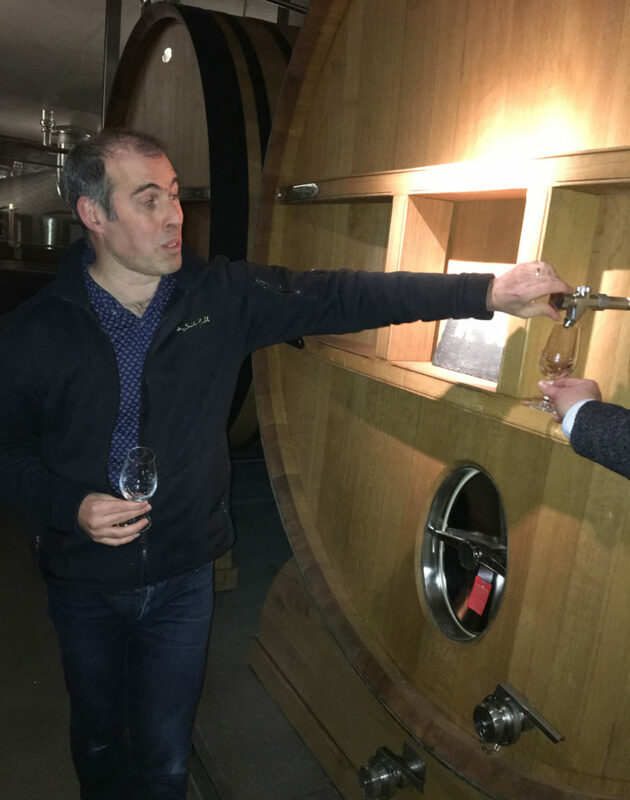 Nathalie and Gilles are putting the final touches on a new winery that you must see to believe – An impeccably efficient gravity flow setup cut into the side of their main vineyard site in Fontenay. If this is the future of Chablis then the future looks delicious. Gilles’ Grandfather and father both held the position of President at the leading cooperative La Chablisienne, and Nathalie was the head winemaker at La Chablisienne for 12 years (until recently all of their harvest was delivered to La Chablisienne). You’ll see several different label iterations from this domaine in the market (when we signed them on we had options), and ours pays tribute to the Fèvre family legacy by referencing ancestors Marcel and Blanche. Fevre Fevre 17 Chablis Grand Cru “Preuses,” more new wood, more extraction, full, minerality, fantastic. The 2018 Chablis party will start with the “AC” bottling this Spring, and will move into Premier Cru and Grand Cru material at this time next year. 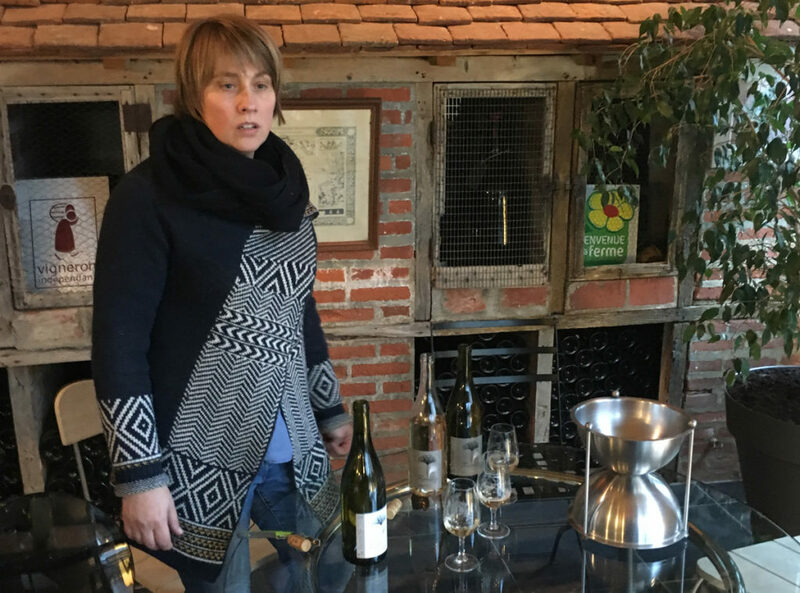 Day three in the Loire took us to Sancerre, where we were able to catch up with our four main producers in the region – Henri Bourgeois, Gerard Fiou, Gilles Lesimple, and Pierre Riffault. Family owned wine companies with the ability to keep the quality sky-high from generation to generation, even at scale…We are into this sort of thing. I suppose you already know this about us though. The Bourgeois family, led by Jean-Marie, Arnaud, Lionel, and Jean-Christophe, hold a figurative beacon for others to follow on this front. At the core this is a family of farmers, yet they are running what might be the most sophisticated, organized operation we collaborate with in France. Famille Bourgeois is farming hundreds of vineyard sites, mostly organic, and often elite. An example? Only twelve families are lucky enough to own land on the highly esteemed Monts Damnes Cru, and of that fortunate group Bourgeois owns more rows than anyone, and most of theirs are on the strategic top portion of the slope. Another example? Somehow they find the bandwidth to run the top hotel in Chavignol and not one but two restaurants in town. Oh yeah, and they actually make wine too. Lionel Bourgeois took us into the vineyards for some immersion on all things soil and pruning, and we tasted a myriad of bottlings at their enviable location overlooking La Cote Des Monts Damnes. Henri Bourgeois 17 Sancerre Blanc “Les Baronnes,” Benchmark cuvée of the family, fresh, nuanced, citrus, engaging. Henri Bourgeois 16 Sancerre Blanc “La Cote Des Monts Damnes,” Classic Monts Damnes, everything there, from the highest plots on the hill. Naked, no wood. Henri Bourgeois 15 Sancerre Blanc “La Bourgeoise,” The monks of Saint-Satur first worked this site, and these are some of the oldest vines in the estate, singular stuff, flinty, touch of wood influence evident but integrated. Henri Bourgeois 15 Sancerre Blanc “Jadis,” Kimmeridgian marl soil, organic, old barrels, charm, powerful. Henri Bourgeois 15 Sancerre Blanc “Les Ruchons,” flintiest plot in the appellation, in the village of Saint-Satur, old vines, mineral intensity, Frank talked about this one the rest of the week. Henri Bourgeois 18 Sancerre Rose “Jeunes Vignes (tank sample),” Young vine Sancerre Rosé – Fun idea, and it delivers. Strawberries, pepper, yum. Love the pricing too. Henri Bourgeois 15 Sancerre Rouge “La Bourgeoise,” Memorable stuff from some really old Pinot vines on SW facing flinty slopes. Totally developed. Magnificent. We also tasted Bourgeois’ very fine New Zealand offerings, and those warrant a post of their own at another time. Want to get a feel for the estate in VR mode? Here is an inside look at the underground family stash, and here is a nice 360 view from the top of Monts Damnes. On that note, Frank, John, and Lionel dared me to try sprinting up Monts Damnes, and I quickly learned that such an activity represents one “damne” fine athletic challenge (and one for, hmm…maybe an actual athlete?!? ), especially after a few pounds of Crotin de Chavignol, but I digress… So here we are happy to report that these fabled slopes truly are at a sixty degree angle and that the clay there is as thick and heavy as it looks on paper. wines is something to take notice of. Young Florent Bourgeois is literally pouring his heart into the property and splits his days between vineyard work and winemaking. Fiou comes as a nice complement to us at Grape as all of their Sancerre Blanc is planted on Silex soil and is intensely flinty, yet reasonably affordable for Monday night usage. We spent some time in the bistro talking about the 2018 vintage with Florent while eating braised veal face (something that, as long as you aren’t vegetarian, you must try with Fiou’s incoming liquid mineral 2015 “Le Grand Roc” bottling). Florent Bourgeois, brining the Silex to your table since, well, about 2012! Domaine Gerard Fiou 18 Sancerre Blanc. fresh, juicy, some flint, very nice. Domaine Gerard Fiou 15 Sancerre Blanc “Le Grand Roc,” broad, big structure, layers of mineral, wow. Domaine Gerard Fiou 16 Sancerre Rouge, fresh fruit, spice, a bit disjointed right now but we look forward to seeing this develop. We hold a special affection for this small property in Chaudoux – Each year we take every last drop of wine available, which is usually about one container. This is a third-generation producer, with father Pierre handing things over to son Bertrand in 2005. Bertrand brings a bit of a unique (and more urban) background to what is overall a fairly provincial scene in Chaudoux – He returned home to the winery after earning a Master’s degree in Sociology, and is just as interested in music and cooking as he is winegrowing. If you make it to the property ask about their unbelievable collection of old clay “crotin de chavignol” molds. The family owns 20 vineyard plots in total (almost exclusively on very steep slopes), and all soils are either flint or of of two types of calcareous clay known locally as “caillottes” and “terres blanches.” In terms of size we are talking 9.5 hectares of Sauvignon Blanc and 1.5 hectares of Pinot Noir. Pierre Riffault 17 Sancerre Rouge, lighter, but quite good, a pallet avail. Neutral barrel fermented old vine Sauvignon from the 2015 vintage was becoming a theme on this trip, and we will take what people offer up! Mark your “new Riffault” calendars for June, just in time for Sockeye Salmon! Gilles Lesimple is probably not a name you’ve heard. Gilles is a good friend of the Bourgeois family, and a farmer with some very nice Sauvignon vines who sells most of his finished wine in bulk to producers you know and respect. This is the case for many a winegrower in this region, is really the backbone of Sancerre as you know it, and it is also a good living, as the bulk price for Sancerre right now is actually a slightly higher rate than most folks can earn for actual finished, bottled wine (especially when bottling costs are taken into consideration). We tasted probably twenty tanks with Gilles, all on various levels of his maze like setup in a connected series of buildings hidden right in the middle of town. Domaine Gilles Lesimple 18 Sancerre Blanc. Fresh, juicy, balanced, very nice. 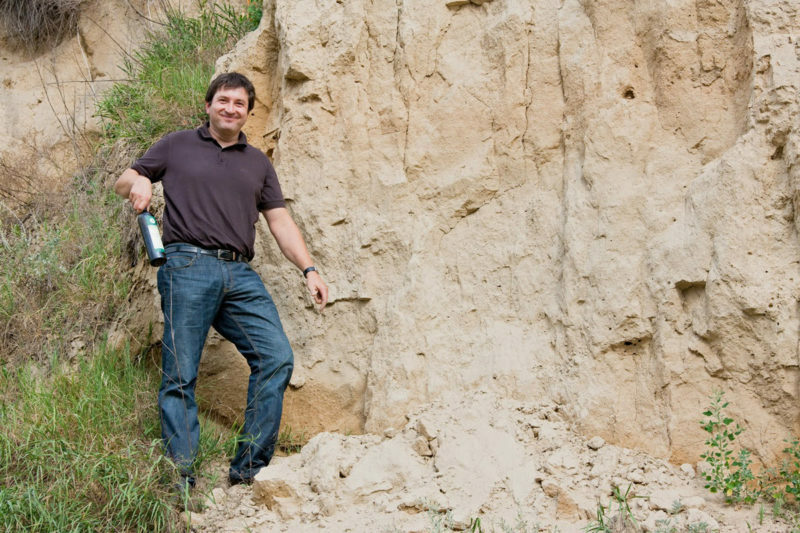 In coming years we’d like to help Gilles on the packaging front, help connect him to other like-minded importers and distributors, and as a result help get more of this very fine handmade clay soil Sancerre out into American refrigerators. The specialty here is clearly the whites, and with plenty of Sancerre Rouge already in the portfolio it is where we will keep our attention on all things Masson Blondelet. The Chasselas is coming to you thanks to the request of Mr. Jal Hastings who is making heads turn for us in the Bay Area – You’ll here more from Jal on the content side of things in coming months. Pierre showed Frank, John, and I something new, as in how to instantly spot a “roundup ready” vineyard as opposed to an organic one (hint: no plastic sheaths around young vines in the organic plots, as organic vines need no protection from the barrage of Monsanto branded glyphosate that most conventional Loire farmers are heartbreakingly reliant on nowadays). I’m standing there stiff like a total idiot at the start of this video but for the sake of unfined/unfiltered video content here you go! Overall this was a memorable/productive visit and tasting. We have a gem here. The lesser wines are the best value-for-money as is usually the case in our travels. If you are a restaurant or retailer reading this, you ought to put on an event where you taste guests on each of the three soil types in Pouilly Fume using each of this Domaine’s three releases – We have a transcript from what was an interesting but “too poor of sound quality” podcast episode for you to use, which you can access here. Want a custom cover for your event? Call our California office and ask for Logan. Cash flow permitting we will probably just buy a full container to save on logistic costs (remember this is the middle of nowhere). Our only complaint in the past was the packaging and WOW have they stepped that game up! Well done Virginie! John and I like quiet, gritty Loire towns. They have character and take a person back in time. 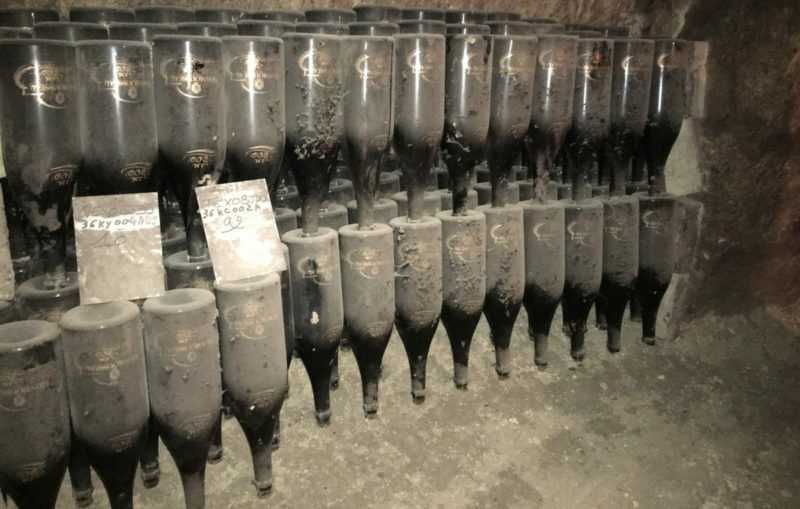 Monmousseau is based in one such town, Montrichard, and while we won’t recommend our hotel to you (Frank especially won’t), visiting Monmousseau’s historic caves is an essential look at the Loire sparkling wine industry’s past. The Dutchman in Frank will call the setup inefficient, but John and I will call it deliciously old-school, with tens of miles of tunnels used to age the sparkling wines produced here. Wines are aged on wooden laths (oh how sad we are that most portions of these caves were too dark for our Insta 360 One camera) and Monmousseau is just now transitioning from rail car transport (yes like a coal mine) to electric fork lifts! One visit here and you’ll be drinking Monmousseau Cremant d’Touraine at least monthly in your rotation. Their entry level Brut Etoile was my go-to sparkling wine in the college days, and while simple it still tastes pretty great. Monmousseau NV Cremant de Loire “Brut Zero,” well made, bone dry, interesting but probably not something that would have pull so a no for us. Monmousseau NV Cremant de Loire Rosé, pale color, slight yeastiness, one more g/L of dosage than the regular Brut.